Shakespeare should be fun. The Bard penned so many classics that to truly appreciate his genius you need to find a way to enjoy it. And what better way to have fun with Shakespeare than to add a little booze to the mix! In Drunk Shakespeare, you're thrust into the Drunk Shakespeare society as you watch five fellow members of the acting persuasion tackle one of Willy's greatest hits. Drunk Shakespeare is a super condensed night of theatrical debauchery as five actors attempt to give you a retelling of a Shakespeare hit. And one of those five will be extremely drunk after a quartet of shots. Now playing at the Lounge at Roy Arias, the hit concept of drunk retellings finds a drastically brazen new take on the Shakespeare classic Macbeth. 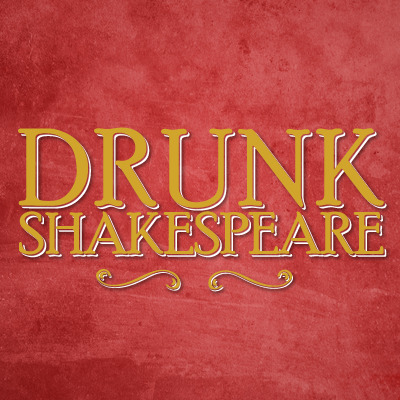 Using the actual text blended with some updated references and a lot of improv, the thespians of Drunk Shakespeare make it their main mission to entertain. The rotating cast take on nearly every character of the script and aid the audience with occasional plot summaries and new choices. And for that lucky actor who gets to be the drunken focal point of the evening, they get a power to make the other four do just about anything they want like changing the titular character’s name to Voldemort. Additionally, one lucky audience member and their guest will get the honor of being the king of the evening sipping expensive bubbly and forcing the night’s shot-filled actor to take part in a duo of challenges. The space has been completely transformed into a lounge of secret society fashion. Attention to detail freaks will note the books on the shelves containing the room are color coordinated. The aura of the room gives off that prominent smoky feel which works well for the atmosphere. By using a space that is custom built there isn't a bad seat in the house or the pen. Despite the ambiance inside it is still an extremely steep ticket price for the venue which does not lend itself well for audience arrival. Drunk Shakespeare is an all inclusive night of fun and games. Be prepared to be pulled right into the action. And be prepared to shell out even more cash for overpriced drinks because one shot won’t do it. But hey, the drunker you are the more fun you're bound to have! Just ask my evening's drunk actor.